The tool wants to encourage farmers to grow and use legumes and to be aware of the positive environmental effects they can produce by doing so. The book describes examples from organic and conventional farms and thus aims at both kinds of farmers. 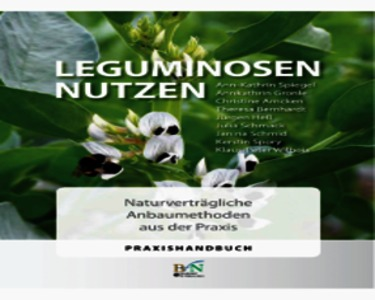 Das Praxishandbuch gibt Einblicke in den vielfältigen und nachhaltigen Leguminosenanbau. Aus der Praxis werden unterschiedlichste Anbaukonzepte auf verschiedenen Standorten und mit verschiedensten Leguminosen veranschaulicht. Dabei wird deutlich, dass es für (fast) jeden Betrieb eine passende Leguminose gibt, die in das Anbau- und Verwertungskonzept integriert werden kann. 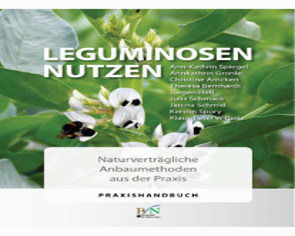 Das Handbuch soll vor allem Lust darauf machen, den Leguminosenanbau in seinen unterschiedlichen Varianten auszuprobieren und in den Betrieb zu integrieren. Get inspired by farmers who grow and use legumes in unusual ways! Many farmers do not know the full range of option how to grow and use legumes, and they are not aware of the environmental benefit they can produce by growing legumes. The book shows different practice examples from farms all across Germany and thus inspires to grow legumes on the own farm.